Violence ensued after an individual who was 23 and supposedly armed with a handgun; was shot dead by officers after fleeing a traffic stop on foot Saturday Afternoon. The initial crowd — estimated at around 100 people — had thinned early Sunday but there were still “a lot of people out,” Milwaukee Assistant Police Chief James Harpole told reporters. “It is still a very tense situation for us,” Harpole added. The man who was killed has not been publicly identified. Milwaukee’s mayor said the man was struck twice — in the chest and the arm — and that he believes the officer involved had a body camera on at the time of the shooting. Milwaukee Police Assistant Chief Bill Jessup told the Milwaukee Journal-Sentinel newspaper it wasn’t clear if the gun was pointed at the officer. “Those additional facts will come out in the coming days,” Jessup said. Police said the man shot had a “lengthy arrest record” and was carrying a semiautomatic handgun reported stolen in a burglary in Waukesha in March. Police said the officer — a 24-year-old man who has been with the police department for six years and has been an officer for three years — was placed on administrative duty following the incident. “We understand the frustration people feel with the police community nationally. … We have to go through the process of finding justice, but we have to be able to restore order to these neighborhoods,” Hamilton said. Aerial video shot by NBC station WTMJ showed a building at a gas station burning to the ground. A second fire broke out at an O’Reilly Auto Parts store less than a little less than mile away from the shooting. WTMJ said it pulled its reporters from the scene due to threats of physical violence from some in the crowd. The Journal-Sentinel reported that one of its journalists was thrown to the ground and punched. It is increasingly evident that the streets of America are becoming war zones. In this particular incident, it is far too familiar with recent history regarding other officer involved shootings. 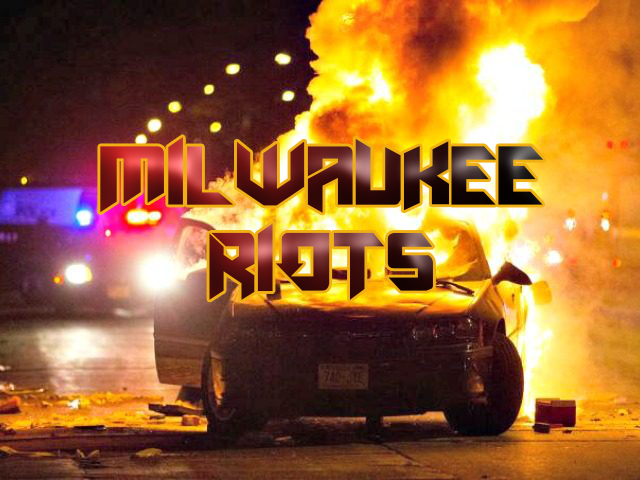 However, the riot that ensued bears a similar resemblance to Ferguson, Missouri; which sparked many different activist organizations that call for an end to police violence. The situation is still ongoing, but it would appear as though the violence and riots have ceased for the moment. As with similar incidents, it is always nightfall that re-brings out the protests and in some cases the riots. To further show that the incident is calming down below are tweets from individuals closer to the scene. MPD is restoring order to the area of Sherman and Burleigh and reducing deployments.